The Information recently published their “Future List” study, conducted w/ Social Capital on Diversity at VC firms. They found that 92% of the senior investors top-tier firms are male and 78% are white. They also found that almost 25% have all-white male managers. Did you get a chance to read the study and were you surprised by the results? Do you think the environment has changed much over the past few years? What are your thoughts on Charlie’s position that the study should be focused on who’s being funded instead of who’s doing the funding? We recently had Semil Shah on the program and were discussing the availability of capital at the seed stage vs. A. While he said it’s fairly easy to raise at the seed round, he mentioned that it’s still much more difficult for what he called URMs, under represented minorities. I recall his comments about how there’s “no welcome wagon in the valley” and how this especially effects URMs. Have you witnessed a climate that makes it especially difficult for under represented minorities? Can you talk about your personal experience as a diverse woman entering this white, male dominated industry? There were many great VC firms that scored very low in the Information’s data set. We won’t name names but generally what message do you have for them? Do you have any thoughts on how they can accomplish a more diverse and balanced firm? Jennifer Fonstad and Theresia Gouw of Aspect Ventures have an initiative focused on building a collaborative network of female entrepreneurs, angel investors and venture capitalists. Do you see an emerging trend of networks and communities being created to help change the lack of diversity we see in venture? You’ve said “The best thing women in tech can do is to invest in other women,” Last fall, 500 introduced its 500 Women AngelList syndicate and pledged to invest $1 million in 10 female-led companies in the portfolio. What are the goals and results you’ve seen from this initiative? Nick: Today, Christine Tsai joins us from Mountain View, California. 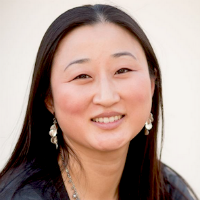 She’s a founding partner at five hundred Start-ups and writes at her blog Christinetsai.co. Christine, welcome to the program.Christine: Thanks Nick. It’s great to be here. Nick: So, can you start us off by walking through your background and how you became involved in start-up investing? Christine: Course, so I pretty much grew up in San Francisco Bay area and you know, specifically kind of in Silicon Valley area and was always around technology pretty much my whole life. My mom was and still is a software engineer at Intel’s so we had computers certainly, you know in the household all the time and because of that, I think that certainly did influence my interest in technology and you know, see the Internet and I also went to school here. I went to Cal and at that time I was quite interested in doing actually web development or web design and unfortunately it wasn’t at the best time. It was you know, vividly remember one summer looking for internship, talking to a lot of different dot coms and everyone hiring and it was all great and then the next summer when I was looking for a full time gig. It was just a very different story so, it was not a great time to look for a job especially in tech but I ended up working at small software company as my first job out of school for a few months and then I left that after a few months to ago joined #Google which was one of the few companies at the time since around two thousand and three, one of the few companies at the time it actually was hiring a lot and I joined not in any kind of web design compasses. I joined to products that eventually was announced as #Ad Sense but was doing all kind of… more like tech support and I remember they were very… didn’t really want to tell us what exactly we were working on. So that first week it was kind of a lot of mindless data. Actually, I almost wanted to quit that first week because they just recruited a ton of people and you know, had them doing a lot of looking at sites and looking at you know all sorts of things but it was pretty like kind of mundane type work. So, you know they wouldn’t tell us what it was it for until they actually made the announcement a week later. So, it was just… but I do remember thinking like, “Ugh, I hate this. I want to quit…” but I just stuck with it and then you know, I was a Google for about seven, little over seven years working on a lot different products. After a couple years, I moved into kind of the product marketing role which has fluctuated I guess when I was there between being under the product team and then being kind of the marketing organization but essentially the PM role would work very closely with the product managers or you know, pre-cross functionally and I think it was really, you know my time at Google and working with a lot of these small developers and small companies I just became more interested in start-ups and specifically, I was interested in what Venture Capital did because I saw it as you know, a role where you actually got to work with these companies and help them build their product and kind of help them find their way so much. I didn’t actually really… I wasn’t a super attracted to the, you know actual investment kind of finance side of it. I mean, I knew that that was at the end of the day, kind of the role but you know it just kind of intrigued by getting into work with co-founders and smart founders and you know, I just kind of found my own way to either get connections or meet people in V.C. or in start-ups and you know. #Dave is a great example. Dave of McClure is now my partner. I met him through a cold intro. I actually asked one of our companies that we were working with at YouTube at the time for an intro because I came across some slides or some videos that Dave did from Pay Pal and developer marketing and I was like, “Oh, this guy knows a lot about developer marketing.” This is like 2006 or 2007. Got a cold intro through that start up and then you know we kept in touch over the years and… But that was kind of how I sort of just, I say forced my way and by just kind of like… was so fascinated by all this. I just was like trying to connect with other ex Googlers who’d left to join a V.C. or there’s people in the industry. I even you know, I was running Google I.O. the last couple years, I was at Google and I took it upon myself to create a V.C. panel that I was super proud of you know among the other things that I was doing, trying to get the conference together but I really was like fascinated. “I want to put together V.C. panel…” and invited you know, Dave and invited a bunch of other people that either was intro through these other investors or I just called cold emailed and that’s honestly how I initially got into the investing side and then I you know, in 2010, I decided I was ready to leave; kind of the message I gotten from talking to a lot of people was that V.C. is not something you can just go and apply for of course. Its very network based and even at the time, I didn’t even think about just kind of the diversity or lack of. Interesting enough, it wasn’t actually something I was really cognizant of until after I left but then you know, Dave and I you know, met up for coffee and you know one thing led to another. We’re talking about you know, saying that I was seriously deciding to leave Google and at the time he was starting to try to raise for the first fund for five hundred. Couple weeks later I ended up leaving google to join Dave and get five hundred off the ground and it’s been five years since then. Christine: Oh, yeah! That’s great! Nick: Yeah, yeah and also just recently chatted with #Tom Tunguz. Did you happen to be a Google at the time that those guys were there? Christine: I’m actually not sure when Leo was there. I’m sure that we probably crossed over but Tom definitely. We actually worked on the same products although different teams at one point but we were working on Ad sense that the same time and then I think he joined the product or like this PM and we crossed over a bit and we worked a little bit together but yeah, Tom is amazing. He’s actually you know, an example of a Googler turned ex Googler turned V.C. that was super helpful to me as I was kind of trying to find, figure out what I was going to do and he was always very open to conversations and that was certainly my experience from Goggle. Nick: So I take it the ‘ GO BEARS’ on your Angels profile is for the Cal Golden Bears and not my beloved Chicago Bears then. Christine: Oh, yes! Yes, it is the Berkeley. Nick: Well cool… So, today’s topic is really, Diversity in V.C. and a bit more of a general topic today but a really important one that we probably should have addressed long ago and it’s a big privilege of have you on to talk through this with us. Just wanted to start out. So the information recently published The Future List Study. They conducted that with social capital and it was on diversity at V.C. firms. They found that ninety-two percent of senior investors the top firms are male and seventy percent are white. They also found out almost twenty-five percent have all white male managers. Christine, did you get a chance to read the study and were you surprised by the results? Christine: Yeah, I think when the study was released definitely read through it and terms of results, it’s not too surprising. I think that is probably the state of V.C. in general. It was interesting to see… I was actually a little bit curious on how the methodology worked. You know, obviously will put myself out there and say with a little bit bumped out that #500 wasn’t on the list but I think the way that they had considered companies was based on maybe fun size or stage. I think they made some exceptions for firms or groups that didn’t fall into that. So you know, certainly like white commoners not considered like a late stage. Well, maybe now they are but at the time you know, they weren’t but you know it’s great in general to see this being discussed more. You know, I think it’s the lack of diversity I guess, that’s sort of the reality at least at this point. Not necessarily like all doom and gloom. I think there’s certainly been you know, a lot of investors or funds that have broken out in terms of, they don’t fit that prototypical V.C. that aren’t male and all male, all white but I think we do have a ways to go. Nick: Do you think it’s trending at all by use the environment changing or has it changed over the past few years? Christine: I think it has definitely changed. It hasn’t had exponential growth. I think the way that we expect start-ups to have at least twenty percent month over month growth or anything like that but it is slowly changing and I think you know, the thing is also that there is sometimes a bit of a stigma around the topic in general because you always find the you know, the folks who vehemently disagree and say this is not a varsity problems, side gender problem, blah, blah, blah whatever excuse but it is clear that the fact that this is being talked about more, the way I see it is that change is always uncomfortable. There’s always for significant change to happen, it does take time and it’s not like a fun, happy sunshine process where people are very motivating. There’s always going to be someone either who to doubts it or feels like resistant to doing it. So I mean, I’m sure this is happened with many, not even specific to kind of our little bubble of start-ups and V.C. If you think about even throughout history when changes happen, it’s been very painful. You know, I’m sure we don’t see people dying because V.C.s are all white male but I think people sometimes take the opposite approach of avoiding the topic or kind of feeling like, “Oh well, I can’t say anything because someone will jump down my throat because I’m a white male V.C.” but you know I mean, I think that type of stuff will happen for change to happen. I’m still optimistic even though the change is probably slow but you know, especially 500. We want to do what we can tell least invest in what we believe in and have our own thesis of what we believe in. Hopefully that has some impact as well. Nick: So Christine after the study came out of course, Charlie O’Donnell wrote his response that he was disappointed in the data and it was because he thought the data was excluding the most important statistic of all. All the results. So, who is actually building a portfolio whose founders reflect the diversity of the greater population? That was sort of Charlie’s question. What are your thoughts on his position that the study should be focused on who’s funded instead of who’s doing the funding? Christine: I think that’s a very good point and I think kind of the downside of lumping all white male VCs into one group. You know, sometimes it’s not fair because there are arguably many investors who fall into that gender race identification that are actually very, very diverse in terms of how they look at V.C. in terms of the actual… in the numbers of companies they funded and whatnot. So I do think that’s fair but I don’t think that it should be completely quote, unquote, “Power” in terms of giving capital to these founders, it still makes a huge difference. I mean, Charlie is one great you know… He could be just one great example but looking at kind of the broader state of V.C. and who gets funded it’s clear, I don’t think its coincidence you know. So, I think it does make a big difference when you have the diversity on both sides. Nick: While he said it’s fairly easy to raise that seed round, he mentioned that it’s still much more difficult for what he called URMs under-represented minorities. I recall his comments about how “there’s no welcome wagon in the valley” and how this especially affects URMs; have you witnessed a climate that makes it especially difficult for under-represented minorities? Nick: Yeah, I’m seeing him this week. Nick: White guys funding white guys, right? Christine: I mean, I feel like sometimes that it’s not always fair to tell investors who are like that like I said before but I mean just if you look at founders who are say entrepreneur presented are targeting under-represented customer segments, it is certainly challenging. Nick: Right. Would you be willing to talk about your personal experience as a diverse woman entering a white male dominated industry? Christine: I don’t know David’s calendar but I you know… I would certainly get irritated by it but I think about it and like one hand it’s probably a, you know… it’s on me to try to get more visibility for myself. The other thing is you know, sometimes it’s the assumption that you know someone who’s in kind of an administrative role is female and they see Dave and Christine they think , “Oh, okay maybe she’s like his support or chief of staff or something” and you know that’s not great either so.. but again I think it’s you know, certainly when that happens it’s an annoyance but for anyone who experiences that shouldn’t be something that you try to let it get you down. Nick: Can’t even imagine. I’m sure you have to deal with a bunch of this B.S. all the time. Christine: …he loves the media and he’s just really good at it. It’s just not for me, not you know, I’m probably the polar office. So, it’s just been kind of like my own personal challenge to myself to try to get out there more. You know, certainly for anyone whether they’re male or female I think if you’re in V.C. I think it’s actually very critical to build that personal brand because ultimately it’s great for deal flow, it’s great for representing your own fund etc. Nick: Yeah, well we certainly appreciate you making the time for us but circling back to the study from the information; It’s real shame that 500 wasn’t included because the stats I’ve seen on you guys it not only internally but extremely, the portfolio companies that you invest in welcome into the accelerator are quite diverse but Christine there were a number of great V.C. firms bet scored very low. I don’t want to name names here but generally what message do you have for them? Christine: I mean, you can always say, “Yeah, you need more diversity, you need to hire a woman partner and you need to hire a partner that’s been under-represented minority” but I don’t know if that’s necessarily as powerful as saying, If you have a more diverse team and profile, you actually will perform better and maybe they have data that says otherwise maybe they think, “Well, you know what we funded mostly white male founders and our I.R.R is awesome” but I do think that if they really want to you know make more money and in our view, You should be looking at markets that are you know, they’re huge markets but they’re not necessarily ones that are either over, you know getting funded a lot. It’s actually you know, in some sense it’s to their advantage to be wanting to invest in markets that aren’t, like Mavens a great example, like we have very high hopes for them. They’re not targeting kind of the typical audience that most V.Cs would look at. We certainly have great companies who are outside of the US that are in Southeast Asia or in Latin and they’re doing great and you know, I think the general pushback from a lot of V.Cs is they don’t want to invest in markets they aren’t familiar with because they don’t feel like they can add value but I do you think that they should try to challenge themselves and try to either get into these markets or think about a strategy to do so. Whether it’s like getting out of the building and going to those markets or hiring more diverse staff. That’s it. I kind of wonder about hiring a more diverse staff because I think sometimes when I hear V.Cs talk about it, the it sounds like they’re just saying, “Oh, look we hired a, you know, a female partner. Yay!” as if they kind of like, “Look, I bought a new car or I have a new trophy” but it’s not. It’s just sort of a poster on the wall versus what is that partnership really about, what are their values. So, I think it is challenging and actually one of our partners on the investment team, Andria Barrica. She wrote a great post about this called like, “How much diversity does a start-up have” and saying like you know, as you grow it gets harder and harder to solve that quote, unquote like ‘diversity problem’ because if you aren’t already set up for that or if you don’t already have networks of diversity, it just… it makes it a lot harder the more your team grows. So it’s just… It’s an interesting thing about how that effects the V.C’s that are usually very small partnerships so they’re nationally going to want to hire people that they know and their networks probably are of… maybe don’t include a lot of people of color or women or whatnot. So, you know just going back to your main question was this you know, you could be performing maybe even better if you had more diverse outlooks. Nick: So Christine, #Jennifer Fonstad and #Theresa Gouw aspect ventures have an initiative focused on building a collaborative network of female entrepreneurs, Angel investors and venture capitalists. Do you see an emerging trend of networks in communities being created to help change the lack of diversity we see in venture? Christine: Definitely, I seen that and I think it’s actually great I know there’s always people who feel like they that having say you know and a female network or you know, kind of a network just for a particular group of people is worse and it should be mixed but I think things like Jennifer and Tracy are doing are and a lot of groups are, they’re either building a network of female entrepreneurs or you know, whether it’s women only or not or if it’s of a certain ethnic group or not. I think those are great in terms of trying to bring more visibility of say, “Hey” you know. There are a lot of angel investors that are also women and this is a great way to connect with them or you know other you know there are example of an organization is Black Founders which is run by #Monique Woodard and a few other folks. I just happen to know Monique from the group but you know they’re dedicated to providing a network for African-American entrepreneurs and founders or people who are just kind of interested in start-ups and I think that will hopefully continue to grow. Especially in areas where you know outside of Silicon Valley and in terms of like if these kind of growing communities or networks, like does that help change diversity? I mean. I think for some of them the groups are newer and personally I don’t have any data that the more of these ethnic groups or it actually has in long run, does it change the lack of diversity. So, no hard data but I can say like for us personally for 500; a lot of these groups have been a great source of deal flow in terms of finding great teams and you know great founders. So, I think you know for us like we’ve definitely looked to a lot of these groups in terms of being kind of an informal partner having good relationships with them so that we can seek out founders were building great businesses and they happen to be under-represented or their on top of that they are targeting the represented minorities in terms of the customer segments. So, I don’t know how other investors are approaching these groups or if they actively get referrals from them or what not but depending on the group it’s great to tap into them and have relationships with them.